Exploring Kentucky is discovering all the things you know about, and some of the things you don't. It's experiencing horse farms, world class restaurants and attractions. Visiting Louisville offers hospitality, warmth, small city excitement, entertainment, waterfront parks and historic neighborhoods. 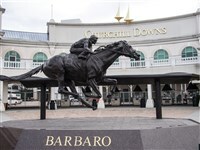 Also visit Lexington, The Horse Capital of the World, including race tracks, historic homes and horse farms.